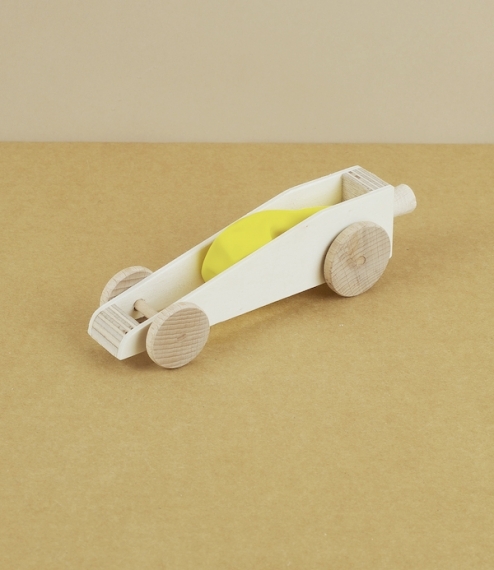 A balloon powered rocket car, handmade from local timber and birch ply off cuts at the Hohenfried Werkstätten in the German Alps. Hohenfried Heimat is an open community of learning disabled adults and children, providing sheltered accommodation, schools, and employment in organic agriculture, craft workshops, gourmet kitchens, and bakeries. Approximately 16cm in length, 4.5cm wide, and 5cm high - uninflated. Assorted colours of balloon.